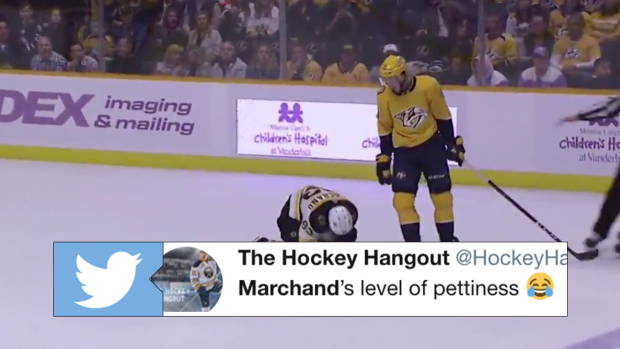 On Saturday night, Brad Marchand received 14 penalty minutes in one sequence against the Predators and one could argue he actually didn't deserve any of them. In the closing moments of the first period, Marchand was given a high-sticking penalty due in large part to embellishment of the part of Colton Sissons. What happened afterwords earned Marchand an extra 12 minutes in penalties. Marchand got an extra minor unsportsmanlike conduct and then was given a 10-minute misconduct on top of the two minors for basically taunting Sissons for diving all the way to the box. Not a fan of Marchand....but this here is fantastic. The embellishments are getting to soccer levels. Thankfully the Predators didn't score with Marchand in the box, otherwise it would have put a bit of a damper on a fantastic reaction from him.